Thanks to all University of Michigan students for spending their time in helping out on Matute-Juarez's new Habitat home. Thank you to our house sponsors, Dow and the U of M Campus Chapter of Habitat - Go Blue! Thanks also to all the Habitat families who came out to help, especially the Stovalls. 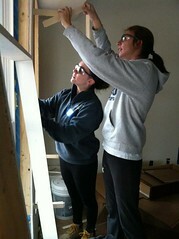 We enjoyed working on the house with people who care and give back to the community. I'm also glad to have worked with other Habitat families on their houses such as Hosanna, Crystal, Quinese, and Linnae. Thanks to Habitat staff: Ruth, Maggie, Carmen, Karen, Rob, Elena, and all the others, and to our support partner Susie Cannell, who was great at guiding us through the process and answered our questions even when she was on vacation. Thanks to Tim for giving me a big, warm welcome at Jerry Wilbur's house. Stay Orange, Tim; Home Depot all the way. And thanks especially to our house leader, Paul for fixing things that we expressed concerns about and for building our house like it was his own. Click here to learn more about the family! Thanks for everyone who came out in the freezing temps to our 9th Annual Beat OSU 5K Fun Run! Due to inclement weather on our scheduled date, we had to reschedule a week later. But this day was very chilly with temperatures around 25 degrees F and few came to brave the cold to run a 5K in the Arb! We would like to sincerely apologize for the route confusion for the leading runners. A good samaritan mistakenly moved our sign when they thought the sign was misplaced but wasn't. The results are found below and congratulations to our winners! Click here to learn more about the family. Read more about Michigan House Dedication! Congrats to our October Volunteer of the Month, Amy Hua! She had quite the month; volunteering at two builds day, Habitat Restore, and Trick-of-Treat Drop-off. Also, we would like to say congrats to our new active members: Evan Clark, Hannah Hoelscher, Amy Hua, Connie Jiang, James Kaune, Max Lettenberger, and Alexander Robinson. We are grateful for your dedication with Habitat. At the November Mass Meeting, we discussed our new plans to restructure Habitat for Humanity at the University of Michigan. Our goal is to increase opportunities for old and new members to contribute to Habitat's presence on campus by adding new roles and responsibilities. With that in mind, we are introducing the Fundraising Division. If you are interested, there is an informational meeting on November 12th at 7pm at Haven Hall Posting Wall. If you are interested in becoming our next Volunteer Coordinator or Community Relations Co-chair, the application can be found here. If you have questions about the role and responsibilities, please contact Jennifer (woodsjen@umich.edu) for the VC position and Emily (emfisher@umich.edu) for the CR position. Applications are due on November 13th at midnight. Still interested in the Beat OSU 5K Fun Run? It's not too late to register! The run is on November 23rd with a race start time at 1pm. If you are also interested in purchasing a Fun Run T-shirt for $10, please contact us here. The t-shirt is neon yellow with navy blue print.